Mabuhay Los Angeles! 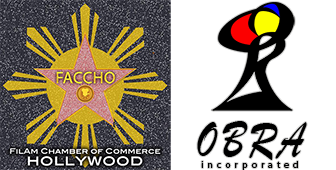 The Filipino-American Chamber of Commerce of Hollywood (FACCHO) invites you all to KARAOKE & NETWORKING with us on Friday, March 22, 2019 from 6:00pm - 9:00pm in Glendale, California. You don't have to be Fil-Am, everyone is welcome! With Comedian Erick Esteban as host & "Ninong of Hollywood" and Ap De Ap Foundations Executive Director Ted Benito opening the mixer- we have a fun evening of karaoke & networking ahead! - Spin-the-wheel prizes including free FACCHO membership, professional headshots, & more! Thank you all & see you at Brewyard Beer Company this Friday! From 1995 to 2000, Edwin was hired as Editor for the award-winning popular fansite, 'The Towne Cryer News on Renee Zellweger.' There, he reviewed her movies and wrote about the film business. He returned to blogging in 2015 as Online Press for FilAm Creative's blogsite until 2018. 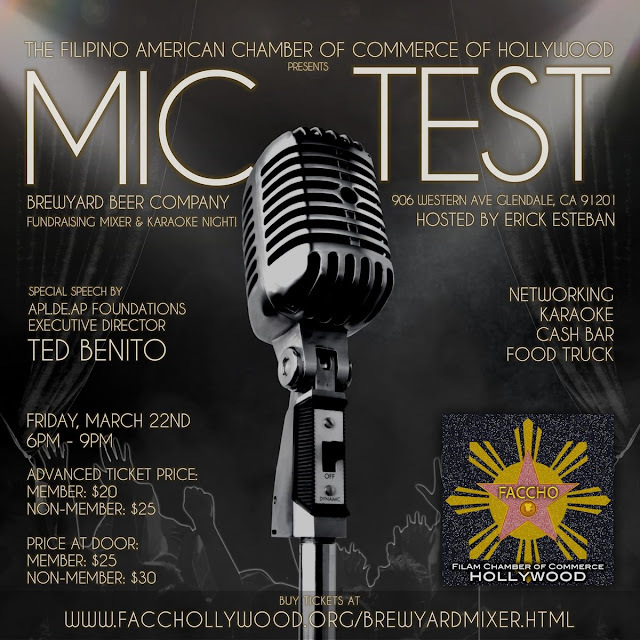 He wrote highlights, spotlights, op-eds and reviews about Filipino American talent in the Hollywood entertainment industry. His extensive and detailed interviews with Executive Story Editor and Writer of the CW’s "DC’s Legends of Tomorrow," Ray Utarnachitt, Film Producer Mark V. Lágrimas of the horror film, "They're Watching," professional wrestler Kris Wolf and other interviews were well received and shared with readers and genre fans alike. One of his op-eds titled, "Self Acceptance vs. Self Denial: This Is My Filipino American Story" went viral and was shared by many including Seattle's Filipino American National Historical Society and New York's "Asian American Life." Currently, he is Editor-In-Chief for the Filipino American Chamber of Commerce of Hollywood's monthly Arts Business Entertainment (ABE) Digital Magazine. He is also a SAG/AFTRA actor and an award-winning film producer.